Scratch and sniff horticulture - there is nothing better. How many remember the stickers that you had when you were younger? The ones that with a scratch of your nail, the smell radiated from the paper. This should have been a sticker to enjoy year round, not just during the growing season! And then of course the plant should be enjoyed during the late spring, summer and into early fall. If you love the smell of popcorn, I think this plant is in your future. Just recently I was in two different landscapes and both had this plant incorporated into their gardens. I get hungry just thinking about it! 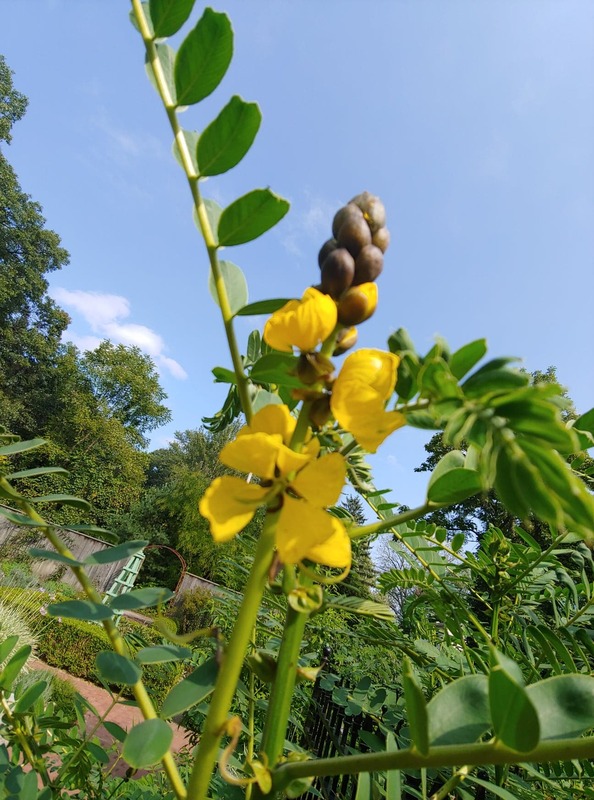 The popcorn plant (Cassia didymobotrya) is an annual that can grow 6 - 8 feet tall and has an equal spread. It has a tropical feel to it. The plant prefers full sun and can bloom nearly all season long with beautiful yellow flowers. The fragrance comes when you gently brush up against the foliage, or run your hand back and forth on the leaves. It is in the pea family and its fruits resemble those flattened seed pods similar to redbud or crown vetch. Just notice the great placement of the plant in the landscape in the photos above. The foliage is at the paths edge so when someone walks by they can enjoy the fragrance. It is not in the back of the garden not easily accessed even though its size might have some thinking that is where it needs to go. I think you can have a lot of fun with this plant. Kids love it, but so do adults - I am living proof. I hope I didn't make you too hungry! If you have the location, this could be a fun plant to add to your landscape in 2019!